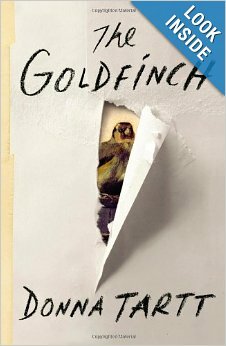 One of the reasons it’s been almost two weeks since I’ve blogged is because the little bit of free time I’ve had has been dedicated to reading “The Goldfinch”, a best-selling novel by Donna Tartt. At almost 800 pages it requires a fair commitment time-wise but it’s worth it. The title is the name of a rare seventeenth century painting by a Dutch master that is taken by Theo Decker a 13-year-old boy when the museum in New York he is visiting is bombed, killing his mother. His low-life absentee father turns up and takes Theo to live with him in Las Vegas where he meets Boris, a young Russian immigrant in his class at school with a similar chaotic home life. As life evolves they lose track of each other until they meet again ten years later in New York. The story is engrossing and entertaining. One friend found it to be a bit tedious about half-way through but I rather enjoyed the level of detail and minutia. I’m always amazed at how authors come up with such plots and characters. The book is full of vivid descriptions of alcohol and drug-taking and leaves me wondering whether the author gained this knowledge through personal experience or thorough research. She also is knowledgeable about European art. Characters are clearly described with philosophical observations throughout the book and particularly at the end where she ties up the loose ends. The painting is treated like a live character. I can see why it is a best-seller. Next PostFrench women get it . . .